iNEMI was supported by SMTA and its members in developing this chapter. In this chapter, discussion of board assembly process includes leaded component insertion (for wave soldering) and/or solder paste application for (SMT) on the bare PCB and ends at printed circuit board assembly (PCBA) test. It also includes special processes such as underfill application, odd form component placement, etc. Although test and inspection actions occur throughout the board assembly process, they are not addressed in this chapter. 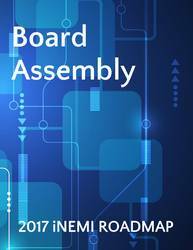 Sections within the Board Assembly chapter focus on several sub-areas within the board assembly process. These are: new product introduction, assembly materials, surface mount technology (SMT), placement, dispense technology, wave and selective soldering, press fit, rework, and direct chip attach (DCA).